Is it possible to set Operating System to 512x384 resolution on System 7 on real computer? Fusion PC 3.0 only allows the choice of: 640x480, 800x600 and higher. I seem to recall that the screen settings depended on the attached monitor. The Mac Plus and similar, of course had 512 by 384 as only possible setting. I would have to dig out the specs of my Mac monochrome and colour monitors to see whether 512x384 was an option, but I guess it was - if only for compatibility reasons. I know my NEC Multisync could do it, though I hardly used it. MiniVMac runs with a 512x384 screen by default too. I guess much depends how screen sizes were patched into the MacOS for emulation. Real Macs had sense pins at their video output to determine which screen resolutions a given monitor could do. 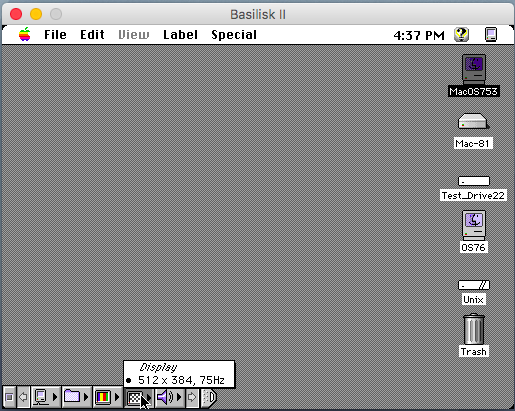 I just used univbe and 512x384 works in Fusion PC 3.0 now.